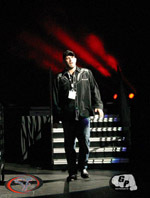 Saturday night October 27, 2007 at the Portland, Oregon Rose Garden Arena was "Homecoming" for SportFight 20. Matt Lindland and his crew once again packed the house with thousands of fans and another incredible night of fights. However, this time Bodogg came to town, bringing with them 4 of their great fighters and oh yeah all of their hot chicks. Bodog matched Chris Wilson vs. Derrick Noble and a highly anticipated Main Event Fight Chael Sonnen vs Kyacey Uscola. The first fight of the night was Aaron Emerson vs Nathan Coy. Coy worked hard through Round 1 but verbally submitted after Emerson's punches knocked out his mouth piece and continued to land on his face. Emerson won 2:09 of Round 2. 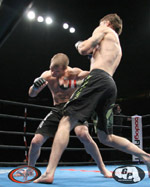 The next fight was a heavyweight bout between Andy Eicholz and Nicolas Krusmarkis. These two big guys locked up and started throwing knees, but it was a rear naked choke by Krusmarkis that ended the fight giving him a Round 2 win. The third fight was quick and decisive as Dave Jansen gets the Tapout due to a guallatine choke over Dennis Parks at 43 seconds of Round 1. Jansen is now the Sportfight Proving Ground 155lb. Champion. Josh Burnham vs Tyson Jefferies featured the classic arm bar submission. Once Burnham secured the arm Jeffries had no other option but to Tapout at 2:10 in Round 1. The second Heavyweight bout of the night was Josh Bennett vs Tim Pereless and both fighters let it all out. Punches and knees inflicted some major damage on both fighters, but they kept going. In round 2, the ref called a time out so that the doctor could look at the cut on Pereless's head, however he chose to continue and Bennett increased the pressure until he won a TKO at 3:18 in Round 2. One of the best fights of the night went the distance, Ian Loveland vs. Andy Lukesh. This 145lb. bout was never dull and definitely displayed how exciting this weight class can be. From the start both fighters showed their skills; Lukesh landed a punch that put Loveland on the mat and somehow Loveland fought through it getting the takedown. The rest of the first round was ground and pound and ended with a reversal by Lukesh. Round 2 featured a text book knee from Loveland that took the fight to the mat again. Both fighters fought hard through Round 3 but Loveland was awarded a unanimous decision. A Kamora submission ended the fight between John Krohn and Corey Devela. Krohn got a big takedown but Devala landed a big knee to Krohn's head. After that Devela secured a Kamora and the fight was over at 4:08 of Round 1. Fight number 8 was fast and furious with Gerald Strebendt getting the Tapout win over Will Shutt by a rear naked choke in 57 seconds in the first round. After an intense stare down during the weigh-ins, there was no doubt that Mike Dolce and Michael Pierce were going to let it all out. These two warriors collided in the center of the ring, both throwing bombs. Unfortunately for Dolce, Pierce's bomb landed first and ended the fight with a one punch KO in 5 seconds. That makes a new SportFight record for the fastest knockout, ironically Dolce holds the record for the fastest KO in the IFL. 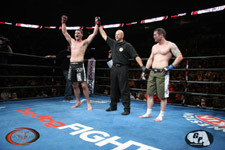 The Bodog Co-Main Event between Chris Wilson and Derrick Noble demonstrated World Class Fighters skills and talents. This was a "Homecoming" for Chris Wilson, this is the first time fighting in SportFight after retiring his Welterweight Belt to fight in the IFL and now Bodogg. His fans were very enthusiastic to see him fight back at home. After 3 rounds of back and forth action that included knees, kicks, punches, and submission attempts. 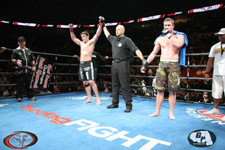 Wilson was awarded a unanimous decision. The Bodog Main Event was something Portland fans couldn't wait to see and MMA fans overall knew this would be a great match. Bodog fighters Chael Sonnen vs Kyacey Uscola. Sonnen is quite well known in the Portland area not only due to SportFight and All Phase Wrestling, but he is also an agent at John L. Scott Realty. Uscola is no stranger to Portland either due to the many previous fights at SportFight. Needless to say - the fans were more than ready to see this fight. These Bodogg fighters have known each other for quite some time. When Sonnen was asked who he wanted to fight he said "anyone except Kyacey.". Sonnen known for his for his wrestling and Uscola know for incredible striking ability made this fight wrestler vs striker. When the fight started Sonnen exploded from his corner attacking Uscola with a flying knee, punches and looking for the takedown. Uscola shook him off a couple of times but eventually Sonnen got the takedown. With Sonnen's aggressiveness he accidentally threw a knee that connected with Uscola's head while they were on the mat. Before the Ref could make the call Sonnen immediately apologized and Uscola received time to recover. Sonnen was then deducted a point. After Uscola recovered the fight was back on. Submission attempts and Sonnen controlling the fight and keeping it on the ground. Sonnen began looking for the rear naked choke and got it before the end of Round 1. Interesting side note after winning the fight Chael challenged Frank Shamrock to a fight in Portland. A sign with that challenge on it made it's way to the ring. So maybe someday soon Portland and Chael will get what they want. Rose Garden fans were pleased to see the "Homecoming" success of some of their most favorite local fighters, who are now thanks to Bodog Internationally known. 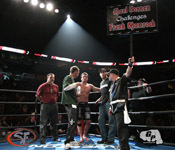 Log on to www.gregsphoto.com and www.sportfight.tv for photos and full results.